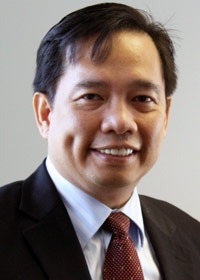 In celebration of the sesquicentennial of Jose P. Rizal’s birth, Consul General Leo M. Herrera-Lim of the Consulate General of the Philippines Chicago will donate copies of the original manuscripts of two of Rizal’s famous novels to NIU. The novels “Noli Me Tangere” (Touch Me Not) and “El Filibusterismo” (The Reign of Greed), published by the National Historical Institute of the Philippines, will be dedicated Friday, May 6, as tokens for the Chicago celebration of Rizal’s 150th birthday in an effort to propagate, enlighten and increase the awareness of the public about Rizal’s literature, not only to the Filipino American community, but also to the broader American audience. Friday’s ceremony begins at 10:30 a.m. in Altgeld Hall 315. NIU President John G. Peters will accept the donation and offer remarks. A reception will follow. The consulate also will hold yearlong activities, including art exhibitions, workshops, cultural presentations, film showings, storytelling sessions, lectures series and book discussions about Rizal’s life, work and famous novels in different venues around Chicagoland. NIU was chosen for this honor for various reasons, including being the home of the Center for Southeast Asian Studies, one of only seven Title VI Southeast Asian National Resource Centers in the United States. Additionally, the NIU University Libraries are home to the Donn V. Hart Southeast Asia Collection, an impressive collection of Southeast Asia related materials, such as original manuscripts, field notes, photo albums, original art work, rare books, large and expensive folios and palm-leaf manuscripts. “NIU has a thriving Asian community, which is vital to the university’s global initiatives,” said Lina Ong, director of the International Training Office at NIU. NIU also has the Philippine Youth Leadership Program, sponsored by the U.S. State Department’s Bureau of Educational and Cultural Affairs, for the last eight years. “The generous donation from the Philippine Consulate General of copies of the original manuscripts of the famous novels ‘Noli Me Tangere’ and ‘El Filibusterismo’ will further boost the rich resources available to NIU’s Southeast Asian, and in particular, Philippine, programs, ” Ong said. Rizal is the national hero of the Philippines and is considered the greatest symbol of Filipino nationalism. With hopes of securing political and social reforms for his country and to educate his countrymen, he published several works with highly nationalistic and revolutionary tendencies. In March 1887, “Noli Me Tangere,” a satirical novel exposing the arrogance and despotism of the Spanish clergy, was published in Berlin, and on Sept. 18, 1891, “El Filibusterismo,” a more revolutionary and tragic sequel to “Noli Me Tange,” was printed in Ghent. Because of his fearless exposures of the injustices committed by the civil and clerical officials, Rizal provoked the animosity of those in power. This made him troublesome to the Spanish officials of the Philippines. When the Philippine Revolution began Aug. 26, 1896, he became a target of those in power. He was arrested and charged with rebellion, sedition and illegal organization. He was convicted of all three after a mock trial during which he was not allowed to confront any witnesses. Rizal was imprisoned in Fort Santiago in Manila from Nov. 3, 1896, until his death Dec. 30, 1896, via gunshot at Bagumbayan Field.